To start with, I am most interested in a home weather station that is a La Crosse weather station with wind speed. Why is this so? La Crosse Scientific Technologies Instruments manufactures and presents the consumer with an array of different types of residential weather stations. These residential home weather stations are made to measure the weather elements as they happen at your home. La Crosse is probably one of the more popular weather instrument technology companies in the world. I trust their reliability and I also enjoy their presentation of weather instruments for home observation. Simply said, I just like their weather stations. In purchasing a wireless home weather station, you should think about what interests you most about a weather station? What part of the weather do you find very intriguing? What do you have the most questions about? Is it the wind? The precipitation? The temperatures changes? Maybe the wind direction? For me, it’s the wind. The wind is usually a strong indicator of a weather change in your locality. Weather changes are always happening, they are always different than what you just had. Always updating, and over a period of time, whether it would be months, years or decades many changes will be recorded by meteorologists. The passing of weather time, will give you very similar weather patterns, which can actually help predict future weather conditions, by applying what their history teaches you. So I choose the wind. In the best wireless weather stations with wind speed that you look at, you will always find the wind is measured by an anemometer. What is an anemometer you ask, great question? I highly recommend you to read the following article I have written, titled What Does an Anemometer Look Like. I posted this article earlier. The article discusses the history of the anemometer and talks about what the differences are in anemometers. I have mentions in previous reviews that the materials that an anemometer is made with can make a difference in the accuracy of it. Whether you are getting an accurate reading should be important to you and your data collection. Over a period of time, a history of wind speeds will make an interesting history for you to study. You will see which weeks, and months are the windiest. You will also see the correlation between frontal changes and how violent the wind is during the weather changes you experienced. Or maybe how bad a rainstorm or snowstorm was as recorded in comparison with the wind speed that came with those changes, and those storms taking place. I was puzzled as to why the two different models. You know why would La Crosse have a model V21-WRTH and a V22-WRTH. I thought maybe one was the same as the previous one but just updated with new technology. However, in my examination, I find that the Model V22-WRTH is the same as the V21-WRTH except for the V22 has the wind direction added to it. The wind direction is adding more sophistication to your La Crosse weather station with wind speed. With wind direction comes another, deeper study of the weather. Maybe you would like to jump up to the added weather data collection by going for purchasing the La Crosse V22-WRTH. So to get the detail about the La Crosse weather station with wind speed, you are invited to read my review of the La Crosse V-22-WRTH by going Here Now. I will not be covering in complete detail the V-21-WRTH here. I will give you what I find are some limited but essential details for your planned out purchase. The Thermo-Hygro Sensor updates every 60 seconds, while the wind speed is updated every 58 seconds. The transmission is a totally wireless transmission between the sensors and the indoors display unit. It is good up to 400 feet. You are able to use the station as a stand-alone at home weather station or you may add it to the La Crosse View App. This will make using the weather station as a mobile device. When you are out and about you will be able to view all details from your mobile as well. Any added sensors may be added by buying them as extras. You may add up to two new Thermo-Hygro Sensors and when you do add them they too may report your sensor information to you on your mobile La Crosse View app. You can read all about my Pros and Cons on the La Crosse wireless home weather station (both the V-21-WRTH and the V22-WRTH) by going to the Complete Review of the V22. This will also give you the features, talk about the wonderful colored display as well, in this review. 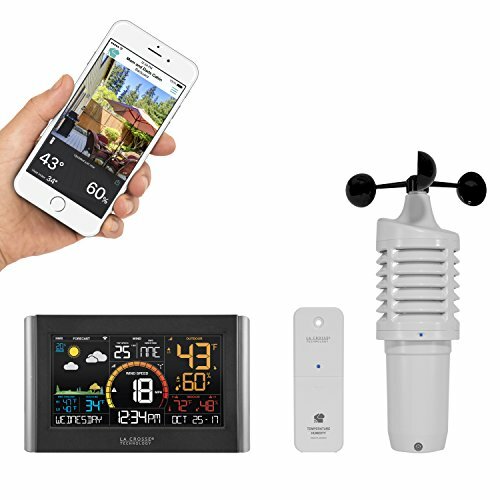 Okay so if you are looking for a weather station, that can provide more information and more challenges in understanding your local weather, you will need to look much closer at this residential wireless colored weather station. I am sure, after reading the detailed review on the La Crosse V22-WRTH, and then just minus the weather vane, that you will decide this would make a super choice, for helping you understand your weather better. You can have a much-improved life by using weather data to plan out and plan around any good or bad weather coming your way. This unit is very value-priced by La Crosse and our recommended purchasing site, Amazon. This is a better selection than a simple weather station. Join all of us Weather Geeks and buy your La Crosse technology color weather station today. See Today’s Amazon Low price. You will also be getting Amazon’s top notch customer service with the La Crosse quality. The La Crosse V40 Pro Weather station is a complete weather instrument kit. This is my look at a La Crosse weather station with wind speed. the La Crosse V21-WRTH is studied as a wind speed weather station. I discuss further the difference it makes not having the wind speed available. The difference between the model V22-WRTh and V21-WRTh are pointed out and written about in detail.